Holi Cow (Mackerel, Sh*t, Moly, Schnikies, Etc. ): Cool Photos! 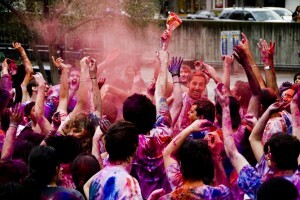 As we mentioned earlier, Holi–the Hindu festival of colors–was celebrated yesterday on Lower Sproul Plaza. And given that the traditional festivities include throwing bright paint powder and water on one another, while dancing and generally merrymaking, you can imagine the fabulously high level of photo opportunity that resulted. O Hai, Why Are You, Like, Totally Wet and Smeared in Dye? Get ready for some colorful mayhem on Lower Sproul Plaza this Sunday. 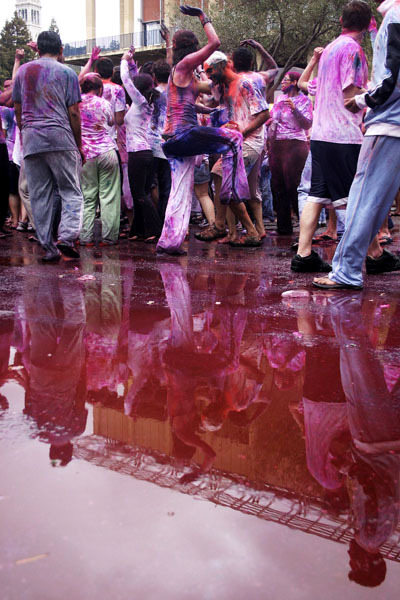 Holi is the Hindu celebration of spring and a whole lot of color, and it’s about to paint the town red … and blue and yellow and green and purple. Everyone is welcome. Wear clothes you don’t mind getting dirty (same goes for bras, FYI). White T-shirts are best. Yesterday Lower Sproul Plaza saw splashes of paint jet through the air and rainbowed hands smear powdered hues. The event brought together all kinds of students eager to celebrate Holi, a Hindu festival of spring and colors. We followed our friends and got a little dirty ourselves. Below, our pictures from the early afternoon ruckus.